Spacious Villa for Sale in Fethiye which has four bedrooms and with its own private swimming pool. Situated on the Ovacik hillside, the Diamond Hills Villas have a beautiful backdrop of Babadag Mountain, with views stretching as far as the eye can see. INTERIOR: Massive interior built over 180 sq mtrs consisting of open plan living, dining and kitchen area with modern fittings. Three good sized bedrooms, all with private bathrooms. Fully air conditioned as standard and beautifully tiled flooring. EXTERIOR: Large private swimming pool with an abundance of sun bathing area. Large patio areas for al fresco dining and relaxing out of the sun. Walled, landscaped gardens offering total privacy. 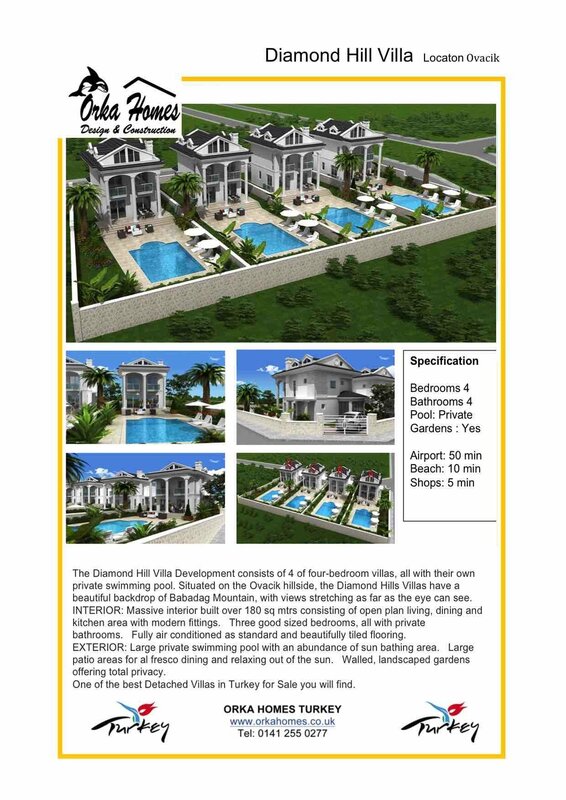 One of the best Detached Villas available in Ovacik if you are looking for Fethiye villas for sale.